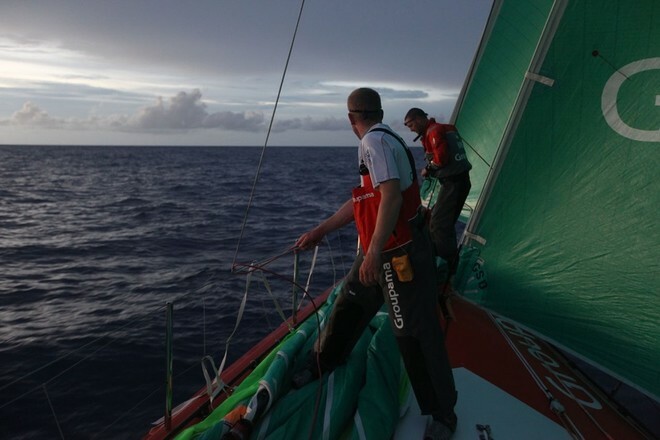 Volvo Ocean Race team Groupama remain in the lead on the fourteenth day of racing in the second stage of leg four from Sanya to Auckland at the 1300 UTC report. The Doldrums have been traversed without hassle, both by those favouring the outer ringroad of the Solomon archipelago and those opting for the shortcut through the islands. As such there haven’t been any major hierarchical upsets, but the lateral separation is still just as big (220 miles) between the leader of this fourth leg, Groupama 4, and the leader of the overall standing, Telefonica. The biblical king didn’t have to make a ruling: the judgement of Solomon hasn’t changed anything and the two parties have now been dismissed. Indeed the Sword of Damocles suspended above the disciples of the West has splashed down! In reality it proved to be a dagger rather than a sword on the water since those favouring the inside track, the Iberians, the Kiwis and the Chinese, haven’t had to suffer the trials and tribulations of what was a virtually inexistent Doldrums due to a breathless monsoon system. The insular zigzagging hasn’t even affected the East-West split between the two threesomes… As such Abu Dhabi’s plans were somewhat foiled as they lost their third place to the benefit of the Spanish. However, Groupama 4 has nonetheless consolidated her leadership since the equator, as she’s extended her lead over Telefonica by a good forty miles, and gained around twenty on Puma. ‘We’ve been in the southern hemisphere since Friday and we’ve had to make our way around the Solomon’s, which is a disadvantage: they are high, which leads to a risk of calms and disturbed wind. We’re somewhat lucky because the north-easterly monsoon hasn’t settled into position. The Doldrums, which are usually situated over the archipelago, will be less tricky to traverse. However we’re unfortunate because those favouring the West won’t suffer its effects. As such it’s not an advantage to position yourself further East as we are, in order to get through this Inter-Tropical Convergence Zone (ITCZ). There’s a big game of call my bluff going on between us and Telefonica, which has been able to slip into a little channel between the islands, without being too affected. We’ll see the outcome on exiting the Doldrums, but the Spanish have a good card up their sleeve…’ explained Groupama 4’s navigator, Jean-Luc Nélias, on Saturday. Though Groupama 4 boasts a 140-mile lead over the Spanish boat in relation to the fleet’s arrival in Auckland, in reality there is only thirty miles between them from North to South. As such the duel is a long way off scoring a bull’s eye! In this way Franck Cammas and his crew will have to go for a final thrust as they negotiate New Caledonia, where they will have to draw the sharp edge of their sword whilst remaining on their guard. They’ll have to stab forward a little at a time before lunging in front of the expected trajectory of the Iberians. Thus, with a more open angle, the French boat should be able to accelerate more than the ‘westerners’, especially as the tradewinds are steadier to the East. It will be important to benefit from this slight edge to avoid any riposte, as Telefonica doesn’t have any way to counter this assault which, if everything pans out as it should, the Americans and Emiratis will also be involved in. Monday evening will certainly be the moment to review the situation in terms of the actual distances to the finish, as the various routes will converge. The eastern trio will make a balestra (sudden leap forward) in terms of miles by slicing through the Coral Sea. Meantime Solomon’s disciples will attempt some avoidance tactics by sailing close to the wind, so as to home in on the direct course and benefit from additional pressure around New Caledonia. This convergence on the way past Vanuatu and New Caledonia is also linked to the fact that the last 1,000 miles aren’t easy to read. Indeed a micro-depression is moving in between the two large French and New Zealand islands from Tuesday, leaving room for a consistent barometric marshland on Thursday. As such it would seem preferable to cover ones adversaries by positioning oneself in front of their bows. This is particularly true given that a weak northerly wind offshore of Auckland could herald another duel with daggers drawn this week between the two Melanesian options.